Mary Glassman and Jahana Hayes. Mary Glassman and Jahana Hayes have similar, but nuanced, positions on gun control, health care, national defense and immigration. In a tough competition to win the Aug. 14 Democratic primary for the 5th Congressional District nomination, both candidates have embraced largely mainstream liberal positions to try to woo voters, and they are running more moderate campaigns than many Democratic candidates for Congress this year. Primary voters tend to be the most activist members of the Democratic and Republican parties. That means, for the most part, that Democrats must appeal to the left wing of their party to have an advantage in a primary and Republicans to the more conservative members of theirs. Hayes, an educator and former national Teacher of the Year, is running as an outsider in a year where outsiders have a special appeal. Glassman, a former Simsbury First Selectman and the endorsed candidate of the state Democratic Party, has been getting fundraising help from key members of the Connecticut delegation to the U.S. House. Both are vying for retiring Rep. Elizabeth Esty’s 5th District congressional seat. 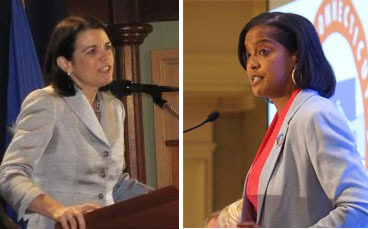 The Connecticut Mirror asked both women to respond to a questionnaire about their positions on some of the most debated issues in politics today. Their responses to questions on key issues are below. Both candidates say they would stop short of abolishing U.S. Customs and Immigration Enforcement, although Hayes said the immigration law enforcement agency may need more than reform. Hayes also says the federal government should make education a spending priority, while Glassman stresses reforms and partnerships with community colleges. Both candidates support a “Medicare for All” plan, but Hayes wants it to be more like a “single payer” system, where the government pays all medical bills and collects money to pay from them through taxes. Glassman wants a more moderate approach, allowing people younger than 65 to “buy into” Medicare as one of their options on the Affordable Care Act’s marketplace. Glassman, considered the more moderate of the two candidates, says she’s a “strong progressive,” while Hayes says her view is that people should give back to the community after they’ve been helped by the government. It is a belief, she says, that is “a little more moderate” than simply advocating for the need for strong federal social service programs. Both Democrats say they would boost federal transportation funding to Connecticut and shrink the federal deficit by repealing GOP tax breaks to the wealthy. What kinds, if any, of new federal gun laws would you support and why? A ban on semi-automatic weapons, “bump stock” ban, expanded FBI background checks, raising the age for possession of a long gun, others? Glassman: It’s time for tougher gun laws now. Thoughts and prayers are not enough, and the American people want no more excuses. Congress needs to immediately take concrete action on gun-safety legislation. I support expanding criminal background checks to cover the existing loopholes for gun shows, internet and private sales. In Congress, I’ll fight to renew the Federal Assault Weapons Ban, which is similar to the ban we enacted here in Connecticut. I also support legislation that protects victims of abuse, which are all too often women, by strengthening the existing laws that prohibit abusers with temporary restraining orders from purchasing weapons. Hayes: The short answer is yes, I support all of those initiatives. One thing I’m proud of is the statues we have on the books in Connecticut. I would love to see legislation passed nationally that mirrors the Connecticut statues. To me, gun violence prevention is critical for urban, suburban and rural communities. My husband is a police officer and practices the safe storage of his firearm, something that all gun owners should be required to do. As an educator, I will oppose any suggestion of arming teachers! What education initiatives do you support? What, if anything, do you think is the Trump administration has wrong on education and why? Glassman: Education is the most fundamental way to expand opportunity to everyone. But in 2018, Betsy Devos and the Trump Administration are undermining decades of progress in education by reducing student loan relief and rolling back civil rights protections. In Congress, I’ll be a fierce advocate for quality education for all—from pre-school to post-grad. I worked as an advocate at Connecticut Voices for Children, where I fought for early childhood education programs. I believe every family should have access to public pre-school. I want to live in an America where parents don’t have to worry so much about childcare and where we invest in families and kids. I’m also a strong proponent of technical and vocational education training at the middle school and high school levels, as well as partnerships with community colleges. The responsibility of educating our children belongs to all of us and we must begin to treat education as an investment. Right now, Trump is asking for $25 billion for a border wall that Mexico was supposed to pay for. That’s almost as much as we currently spend on Pell Grants. We must reexamine our priorities and work to improve our public education system and ensure that all of our children leave both college and career ready. By providing college preparation, internships and job training programs in our schools our young people will leave ready to face the challenges of a changing economy… Teacher quality is the number one factor in student success. Do you support the “abolish ICE” movement? Why? What federal immigration plan does you support, if any? Glassman: As the daughter of immigrants, I understand the American dream and why so many are willing to risk everything for the freedom, safety, and opportunity that this country promises. We are a nation of immigrants, and building walls and putting children in cages go against everything we stand for. As a country, we must create a pathway to citizenship for law-abiding immigrant families—allowing millions of people to come out of the shadows and stop living in constant fear of deportation. Moreover, our immigration enforcement agencies, including ICE, need to undergo serious reform. Throughout my career, I’ve advocated for legislation like the DREAM Act. I’m proud that Connecticut passed legislation to provide financial aid at public state colleges to “DREAMers.” In Congress, I will continue to support DREAMers, DACA (Deferred Action for Childhood Arrivals) and common-sense immigration policies that create a pathway to citizenship. Hayes: When it comes to our immigration system, everything is on the table. My first reaction is not to start tearing down government agencies, but ICE is an agency in desperate need of reform and maybe more. This federal agency should operate in a way that protects the safety and security of our borders and also aligns with the morals and values of the American people. We need to begin the difficult work of reforming our immigration system and not just focus on this agency. We must have comprehensive immigration reform that offers immigrants multiple pathways to earn citizenship, a robust system that addresses the needs of the population and not the outdated framework that currently exist… Dreamers are Americans and we must ensure they also have a viable pathway to citizenship made available to them. They are part of our families, part of our communities, part of our economy and they deserve to live out of the shadows with the respect and human dignity that they have earned. Do you support a “Medicare for all” plan? Why? What do you think Congress should do to help Americans have better access to affordable health care and prescription drugs? Glassman: I support Medicare for All because I believe healthcare is a human right, period. Our government has a responsibility to ensure every American has access to affordable, quality health care. Right now, health care needs to be protected, improved, and expanded. In Congress, I’ll protect the important gains made with (the Affordable Care Act) including protections for people with pre-existing conditions, the ability of young adults to remain on their family plan until age 26, and the expansion of preventative care. I think the first step toward Medicare for all must be allowing Americans to buy into Medicare. A public option will add much needed competition to the insurance market and bring down premiums and deductibles for everyone. We also need to increase transparency throughout the healthcare system by requiring companies to disclose their profit margins when they increase drug prices. I support Medicare for All because I believe healthcare is a human right, period. Hayes: I absolutely support Medicare for All. Experience has taught me that I cannot teach a student who isn’t able to focus in class because they’re sick and can’t afford to see a doctor. I will champion legislation that would allow Medicare to negotiate drug prices directly with drug companies, expand mental health and addiction services, and protect a woman’s right to choose. Under a single payer system, seniors wouldn’t have to choose between paying for their life saving medications and their next meals, and small business owners would not have to choose between growing their companies and providing their employees with access to basic care…Illness doesn’t care about your gender, ethnicity, or political affiliation. It’s a problem that effects all people and Medicare for All is a solution. Do you consider yourself a progressive, liberal, moderate or conservative Democrat and why? Glassman: I’m a strong progressive. Throughout my career in public service, my philosophy has always been to vote my conscience, be a voice for ordinary people, protect the working and middle class, and make opportunity and security available to everyone. From fostering a love of learning in young children to ensuring seniors can live out their days in dignity, I believe government can and should play a role in making people’s lives better. Hayes: I am a proud Democrat because I believe in Democratic ideas. A big reason why I’m even able to run for Congress in the first place is that when I faced adversity in my life, the government was there to help. A part of me could be considered progressive because I believe that government should be there to provide assistance to people who are in need and create programs to help lift people out of poverty. I spent a good portion of my life relying on government assistance. But just as I feel that government has the responsibility of providing for its citizens, I also believe that the people have an equal responsibility. At the point where I was able to stand on my own, I poured back into my community and became a contributor to society. That I guess is a little more moderate. What you think is the best thing the federal government can do to improve Connecticut’s transportation system? If the answer is ‘spend more money’,’ how would you pay for it? Also, does you support high speed rail in Connecticut? The rebirth of rail in Connecticut has the potential to transform our state. We’re already seeing the promise of rail with transit along the I-91 corridor in communities like Meriden. High speed rail would create even more opportunities for businesses and workers and help fuel Connecticut’s economy. To pay for crucial investments in infrastructure, we should stop giving tax breaks to millionaires and giant corporations. Everyone benefits from better roads and less congestion, and we need to prioritize economic growth over giveaways to donors and lobbyists. Hayes: We absolutely have to spend more money on infrastructure and we need to do it strategically, focusing on both local and regional benefits. In addition to new projects like high-speed rail, I will also fight for sensible and long overdue investments throughout the district, such as much needed improvements on the Waterbury Rail Line. How would I pay for it? We could start by repealing the Republican tax plan. I would also like to see a major expansion of rail throughout Connecticut and specifically in the 5th District. For starters, we should immediately enact plans to link Danbury to Pittsfield, Massachusetts by commuter rail. Having a link like that directly to NYC and essentially Boston would be a game changer for all the communities along the line and for the entire region. Would you support a change in the House Democratic leadership? If so, why? Glassman: As Democrats, we are the “big tent” party. Our success has always depended on bringing new and different Democratic voices to the table while embracing the tried-and-true stewards of our party. The House Democratic leadership team is always changing and evolving with that balance in mind. I’d imagine after Democrats take back the House this fall, we’ll see both battle-tested and battle-worthy Democrats sharing leadership positions. Once I know who the candidates for leadership are, I’ll be able to tell you more. Hayes: We absolutely need new voices in our party. It will make us stronger and will help us cultivate new ideas to move the country forward. I do not want that to be mistaken for removing all party leadership. I am not trying to throw out the baby with the bathwater. I am in the business of grooming the next generation of leaders and our Party should be doing the same. We need to usher in fresh faces and new leadership so that we represent diverse perspectives. There is something to be said for the knowledge and experience of our current leadership, however if we are not opening the doors now to welcome future generations to the table it is to our peril. Our congressional delegation should reflect the diversity that exists in our communities. Do you favor more defense spending if it benefits Connecticut’s defense industry? Do you support that increase in defense spending if it resulted in cuts to domestic programs? Glassman: For decades, Connecticut’s defense industry has played a vital role in making sure our military is the best and most prepared in the world. We should embrace any role our highly skilled labor force can play in protecting our country. However, I reject the idea that there is a false choice between funding defense or domestic programs. I’ve balanced budgets before, and you don’t do it by cutting important programs or by laying off hard-working people. There is always another way. Hayes: Connecticut is currently in the middle of a real revival of the defense industry that began during the Obama Administration. The jobs that are being created both at major companies and suppliers throughout the state is a great thing. I see no reason why we cannot also make sure that we have strong social programs in place to help people out. I don’t see these things as separate. Do you care about the budget deficit? If so, how would she shrink the deficit? Glassman: Democrats have always cared about the national debt, myself included. We cannot allow Congress to mortgage our children’s future just because they lack the political courage to make difficult decisions. The only way to shrink the national debt is responsibly — in a way that protects seniors and working families and ensures millionaires and billionaires pay their fair share. Hayes: I absolutely care about the federal deficit. We cannot pass our problems on to our children. We need to ensure that we leave our country better than we found it for them. We can begin to address the problem my repealing the Republican Tax Plan and move towards a system where everyone pays their fair share and the greatest burden is not shouldered by the most vulnerable communities. The candidates’ responses have been edited for length and clarity.